Baking a pineapple upside down cake is always fun !!! The cake itself is so gorgeous that you don’t need any thing else to make the cake look pretty . So when I heard my cousin is coming over to see me , and that was in a very short notice , the first thing came to my mind for dessert is this pretty pretty cake !! 1. Pre heat the oven to 350 FH . 2. Grease a 8′ x 8″ square pan . Now put the melted butter into the pan . Coat the pan evenly with the butter . Add the brown sugar to cover and dry out the melted butter . Arrange the pineapple rings over the brown sugar . Put one cherry in the middle of each pineapple ring . 3. Beat the egg whites until stiff . Set aside . In another separate bowl,beat the oil , butter , sugar until light , add the egg yolks one at a time . Add the syrup and vanilla essence. 4. Sieve the flour , baking powder . Now fold in the flour with egg mixture . Now fold the meringue into the batter in three batches . It should be a velvety smooth batter . 5. Pour the batter over the prepared pan . Tap for few times . Now immediately bake for 35-40 minutes or until if toothpick inserted comes out clean . Serve it plain or with whipped cream or icecream !!! 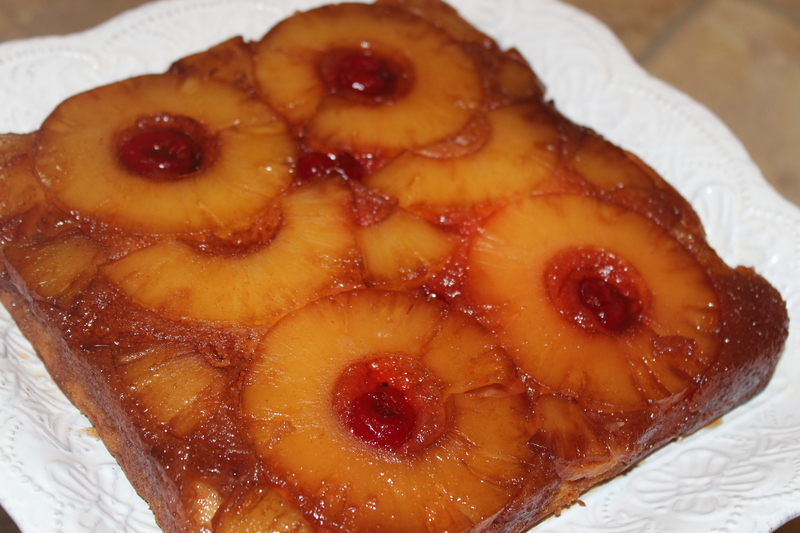 This entry was posted in Desserts and tagged pineapple cake, Pineapple upside down cake, upside down cake recipe. Bookmark the permalink.